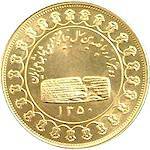 The Iranian unit of currency is Rial - Internationally abbreviated to RI or Ris, which is divided into 100 Dinars. Every 10 Rials is also know as 1 Toman (Toe'man). The Bank Markazi (Central Bank), established in 1960 and operated by the government, is the bank of issue. Commercial banking, nationalized and reorganized in 1979, includes some seven major banks. Q: I have 85,000 Iranian Rials. How much, if anything, might this be worth in American dollors? Q: How much 11,000 Rials in 1962 would have been worth in US dollars? A:In 1960's the exchange rate was between 60 - 70 Rials/Dollar. So, 11,000 Rials in 1962 would have been worth between $157 - $183. Now a days , 11,000 Rials is worth $1.20 (as of 09/28/2007). More than 90 percent of Iran's export earnings typically come from sales of crude petroleum and petroleum products; most of the country's imports consist of manufactured goods such as machinery, transportation equipment, chemicals, iron and steel, textiles, mineral products, and basic consumer goods. In the late 1980s Iran's exports annually earned about $9.4 billion, and its imports cost some $11 billion. The country's leading trade partners include Japan, Germany, France, Italy, the United States, Great Britain, and the Netherlands. Imports and exports are governed by regulations issued periodically by the Ministry of Commerce after approval of the Council of Ministers. In accordance with the mentioned regulations, imported goods arc divided into "authorized" goods. "conditional" goods and "prohibited" goods. Authorized goods have unrestricted importation. Conditional goods are goods, import of which requires respective permits. Prohibited goods are goods, import of which is forbidden upon Islamic Sharia, or respective laws and regulations. Iranian nationals and foreigners are allowed to hold interest bearing foreign exchange deposits with authorized domestic banks. Two types of foreign exchange deposits are permitted. I.e. foreign exchange deposits of external origin, and foreign exchange deposits of domestic origin. Balance of the foreign exchange deposits of external origin may be taken out of the country freely. Foreign exchange deposits bear interest at LIBOR plus one percentage point. There is no limit on the amount of foreign exchange that travelers may bring into the country. However, for the purpose of repatriation, the amount should be declared at the time of entry. The sale of the said amounts to the banking system is permitted. Iranian travelers leaving the country must pay an exit fee of RIs 70,000. Foreign investment in Iran is allowed. The right for repatriation of principal and dividends is guaranteed if the investment is made under the 1955 Law for the Attraction and Protection of Foreign Investment. As for portfolio investment non -residents may invest in instruments traded on the Tehran Stock Exchange.